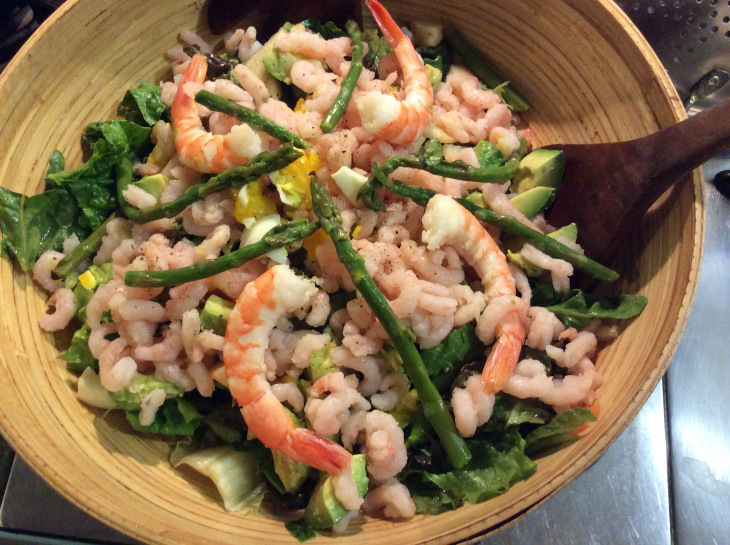 The delicious green bean combination. 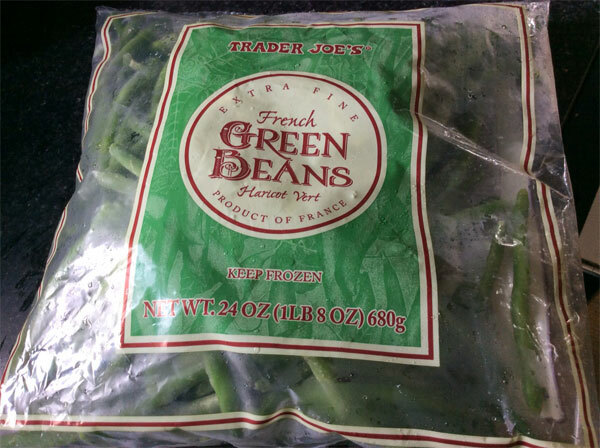 I confess–I use frozen french green beans from Trader Joe’s for this dish. 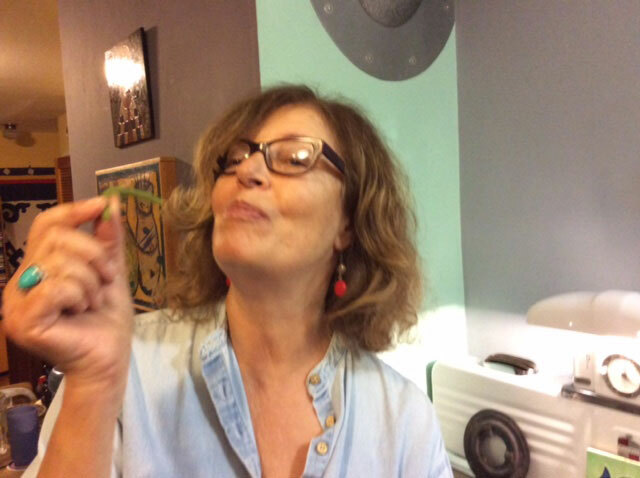 I’ve tried it with fresh Blue Lake green beans as well as other kinds of fresh and frozen green beans and have not found anything better than these. They are tender, tasty and easy to cook. Try them yourself and see what you think. 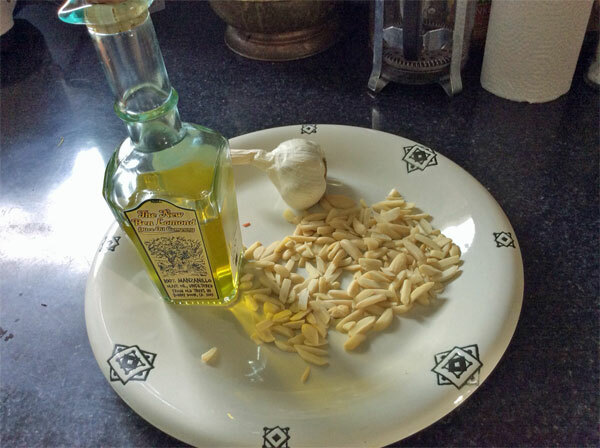 The ingredients are pretty basic, but as always, using really good olive oil, (such as the oil from the New Ben Lomond Olive Oil Company–cool bottle too), fresh garlic (not garlic powder or salt), and toasting the sliced almonds make the difference. 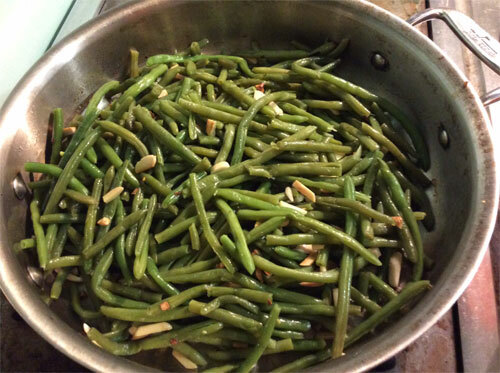 My son-in-law Mike swears they’re the best green beans he’s ever had and requests them whenever we’re together for a home-cooked dinner. These beans are a great complement to my grandmother’s meatloaf–coming soon! 2. Add frozen green beans and water; bring to a boil. 4. Remove beans from pan to a bowl. Heat 2 Tbsp. olive oil; add garlic and saute just until brown (don’t overcook or burn). Remove from pan and add to beans. 5. Heat remaining olive oil; add almonds and toast until light brown. 6. Add beans and garlic back into pan; toss and heat Toss in bacon if you like. 7. Add spices and seasonings to taste. 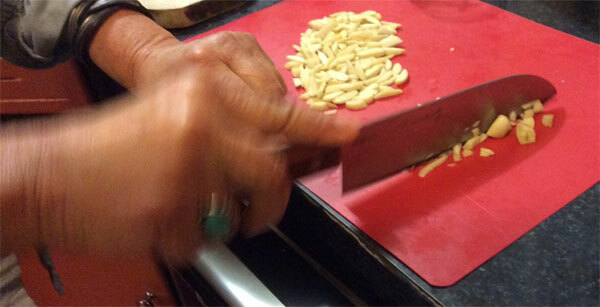 Chopping garlic–not my best skill. I hope to improve. This is a great way to combine a bounty of fresh in-season veggies, tofu for protein and lots of flavor. 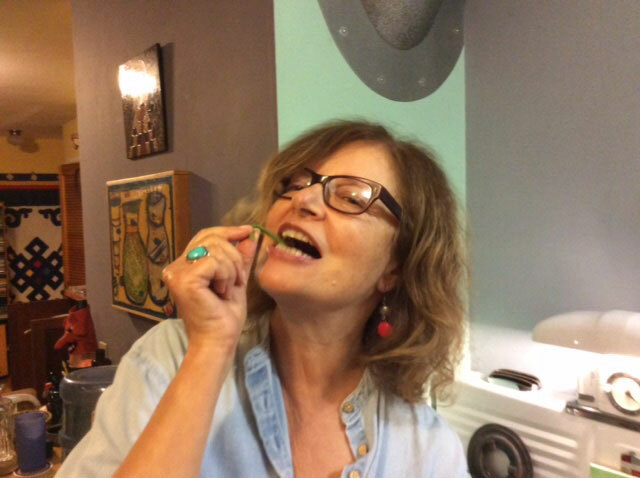 My version includes Vietnamese or Thai fish sauce which we love; (we visited Vietnam a few years ago and it remains a special place in my heart and mind). Yes, there’s quite a bit of prep, but as I’ve mentioned in previous posts, it’s worth it. 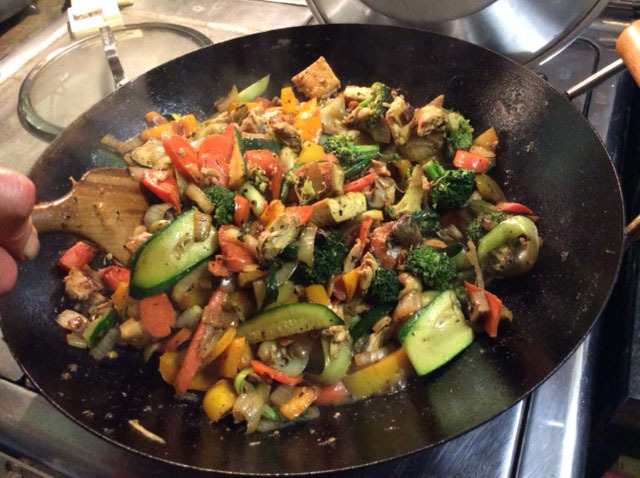 This stir fry is very tasty, healthy and filled with lots of interesting flavors and colors. And with most everything cooked in the wok–at least doing the dishes isn’t too bad! (Ok, there’s one more pan for browning the tofu – I use a non-stick AllClad so it’s easy to clean), and another pot if you cook brown rice as we do to serve with this–again, Rick limits his serving to approx. 1/2 cup. 1. 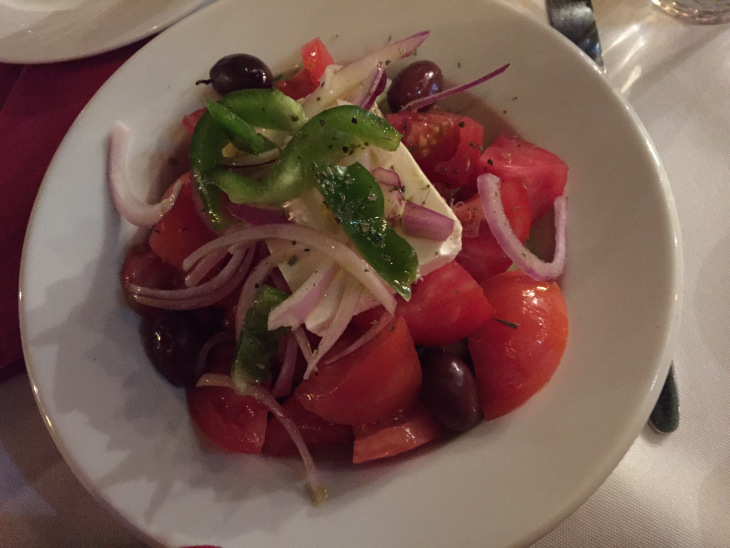 Mix and reserve sauce ingredients in a small bowl. 2. Cut the tofu cube into three or four sections–I cut them crosswise–so that each piece is square. Marinate the tofu sections in approx. 1/2 of the sauce mixture for 10 minutes. 3. Add 1 Tbsp. of oil to a frying pan; on medium high heat, brown the tofu sections for 4 minutes on each side. Remove from pan; chop into 1″ pieces and reserve. 4. Heat the wok on high. When a drop of water sizzles, add remaining oil. 5. Add carrots, broccoli and peppers to the wok–stir fry (I use cooking chopsticks or a flat wooden spatula–sometimes both.) When somewhat tender–about 5-6 minutes–remove from the wok into a bowl. 6. Add onions, mushrooms, zucchinis to wok. Stir fry these veggies for approx. 4 minutes. 7. Add tofu and garlic to mushrooms and zucchinis, (and cooked chicken if using). Stir fry, making sure not to burn the garlic (adjust the heat as needed). 8. Add back the carrots, peppers and broccoli; add sauce remaining in bowl as well as any used to marinate and saute the tofu. Stir fry 2-3 minutes on high ’til everything is well mixed and hot!